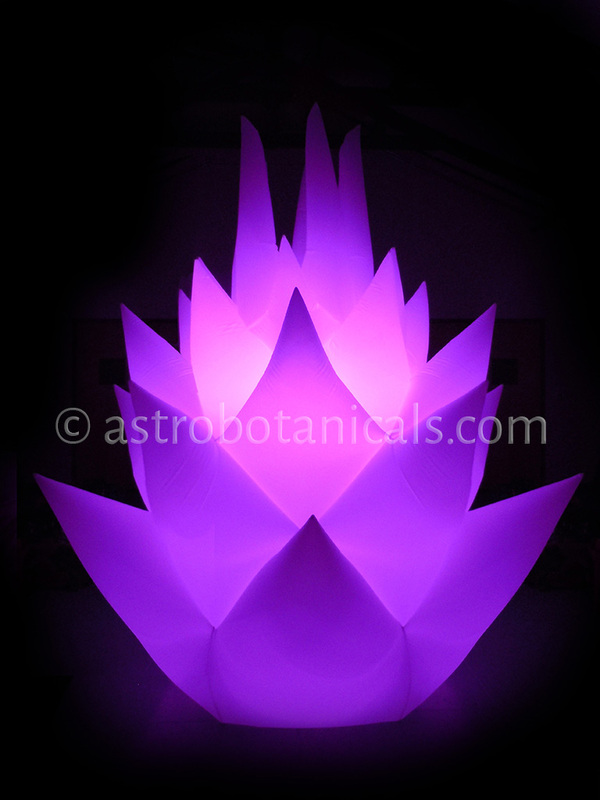 The Dragon Lotus is a perfect five sided flower bud with 30 points. 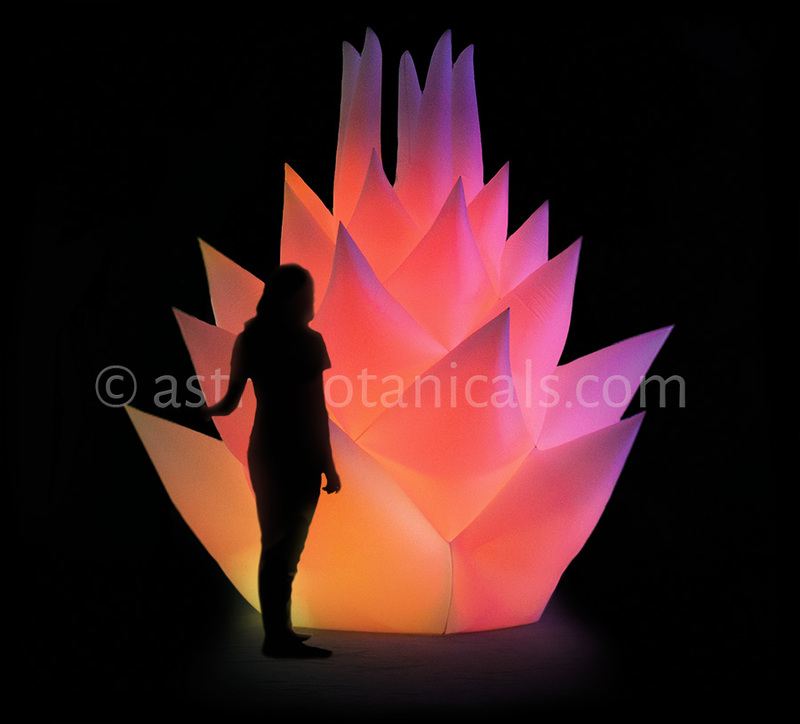 This hypnotic, glowing lotus blossom is a playful architectural ornament. Its natural symmetries and soothing colors are very reassuring. 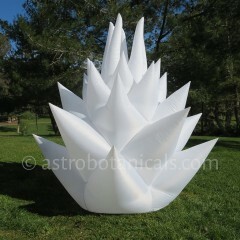 It is the smallest of the inflatable flower decorations and is eight feet tall and eight feet wide with a round base. 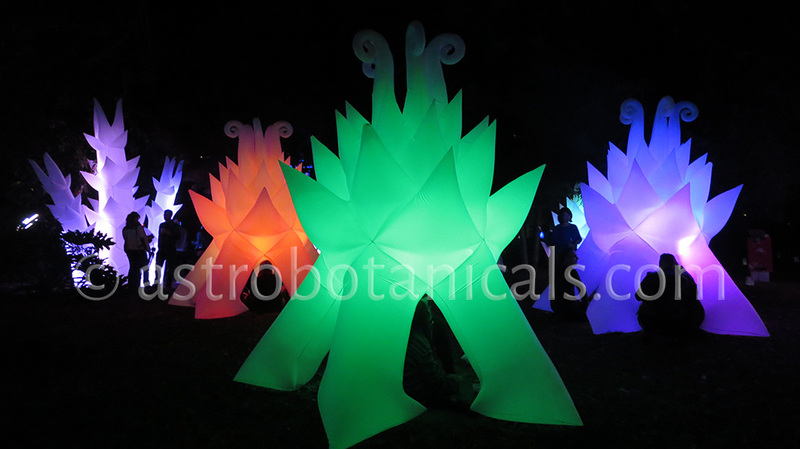 The Dragon Lotus is a large sculpture of a tiny plant, changing your relative size and giving you the perspective of a pollinator. 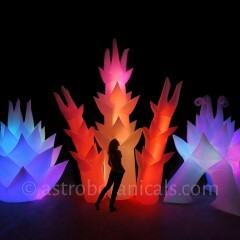 It attracts attention, creates a focus and is great for orientation purposes. It has tabs on its base for rigging upside down like a chandelier in spaces more than fifteen feet high. 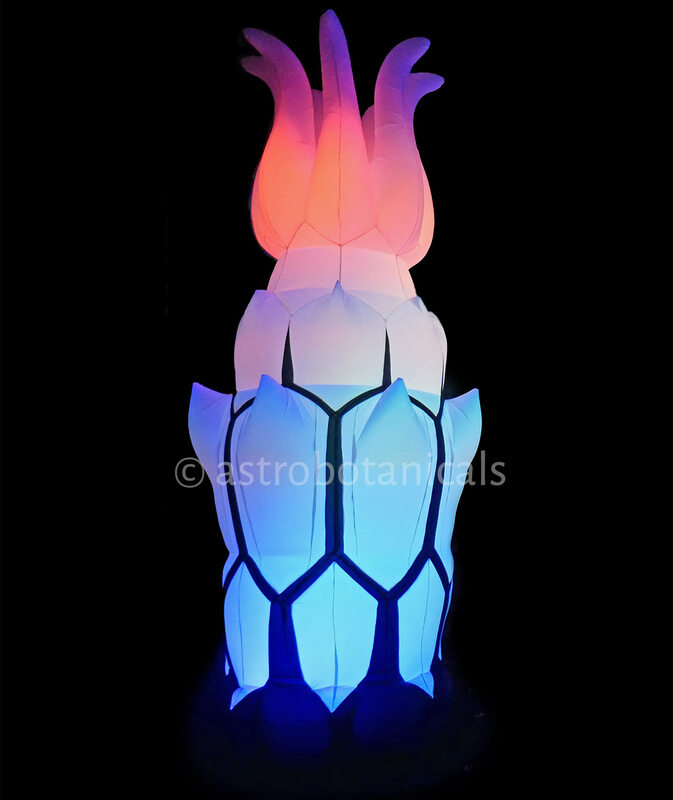 It is a beacon, a cosmic sprouting flower like a vegetable visitor from beyond. 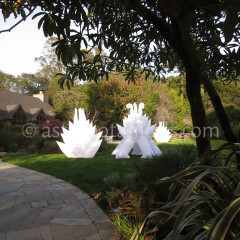 This sculpture is low and round and is stable in a regular breeze. Sandbags go inside the zippered base. It may require more sandbags at winds over 15 miles per hour. 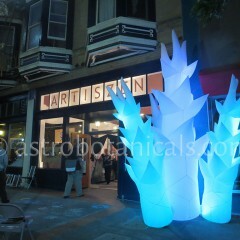 Astro Botanicals inflatable sculptures are made of high quality materials. The fabric is fire retardant, UV resistant Ripstop nylon. The small fan is 115v, 0.26A, with a 20 foot, grounded power cord. 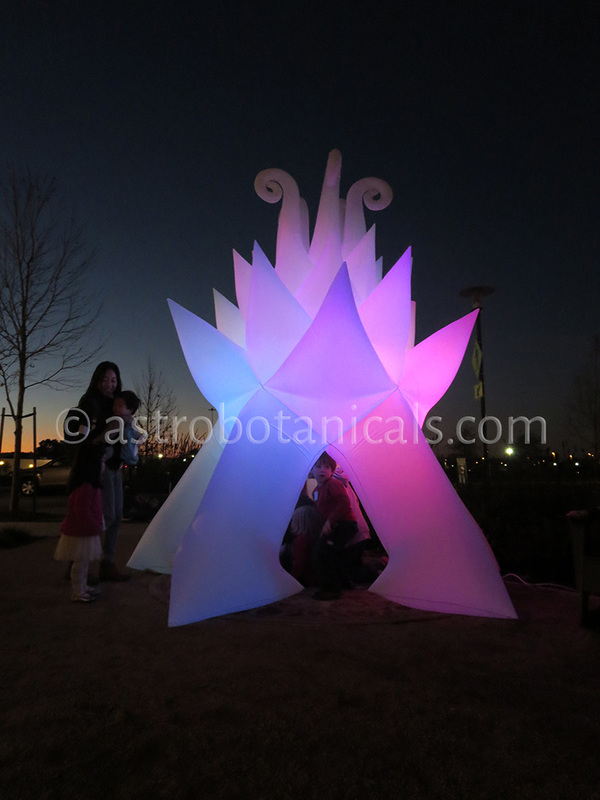 Each sculpture has durable, 0.3 Amp LED rope lights inside with multiple color settings. Each has a carrying bag and comes with three custom sandbags, sand not included. 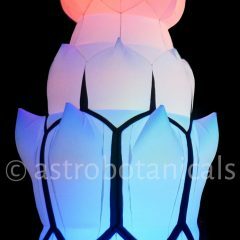 The Magnolia Starship is a standing lotus flower with five legs and curly tops. 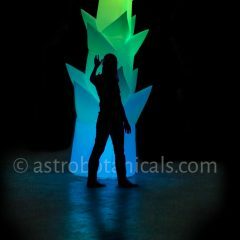 Underneath is a sitting place to gaze up through a clear window at the beautiful geometries inside the color changing light. 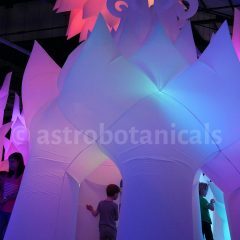 It is a meditative play house, a blooming kaleidoscope and a starfish spaceship. 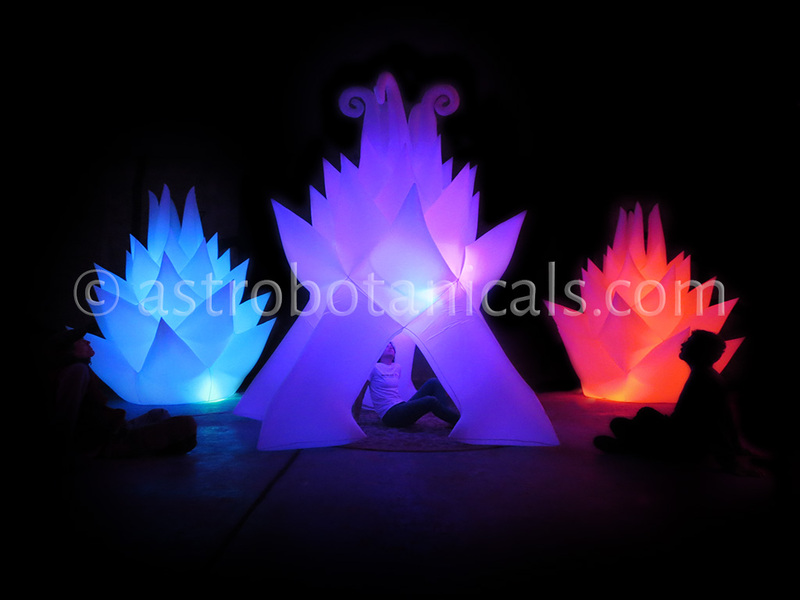 It radiates peace and safety and has a magical influence on its surroundings. It is eleven feet tall and eight feet wide with five small doorways. 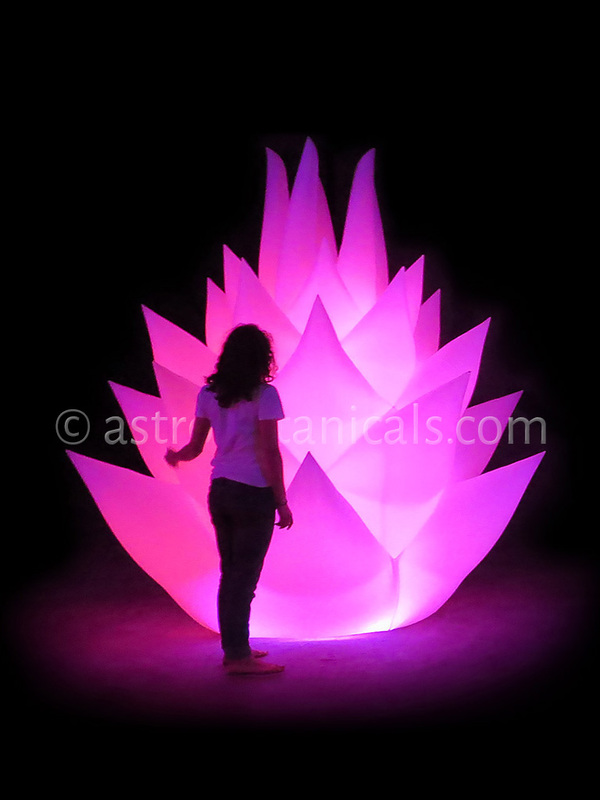 The Magnolia Starship is ideal for creating a special chill zone. Its five doorways are very inviting and just the right size for sitting with a little privacy. This small meditative play house has a window for gazing up at the beautiful geometries inside. Placing a small rug underneath makes it completely cozy. 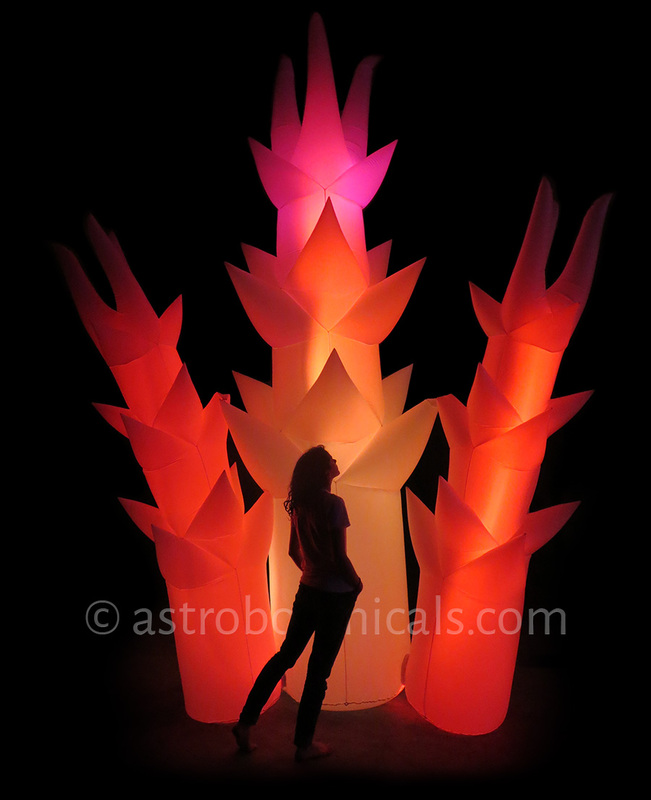 It is like a blooming starfish spaceship, poised on its tip toes for lift off. 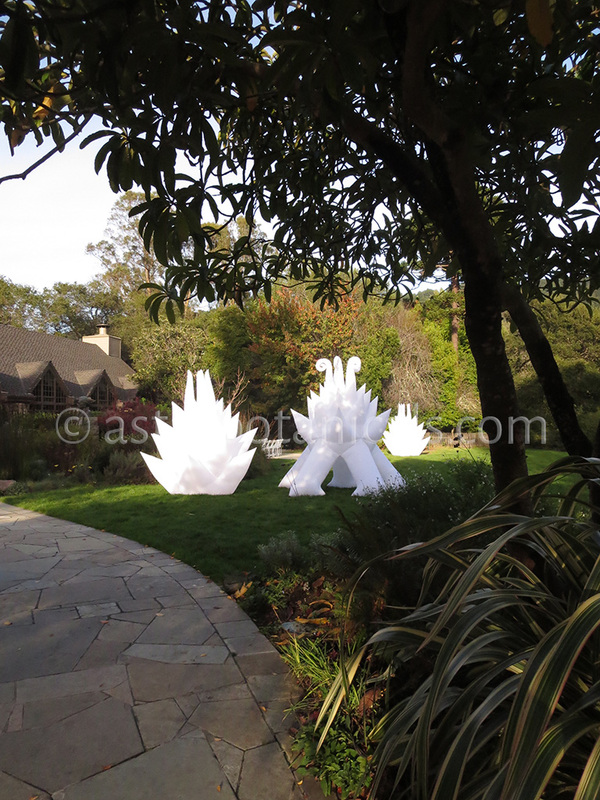 This sculpture stands on five legs and is stable in a gentle breeze. Care must be taken that the fan does not become blocked. Sandbags go inside three of the zippered feet. 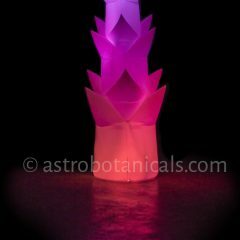 The Angelic Asparagus is a group of four trees that sprout up like cathedral pillars, spreading their glowing branches like living plants. 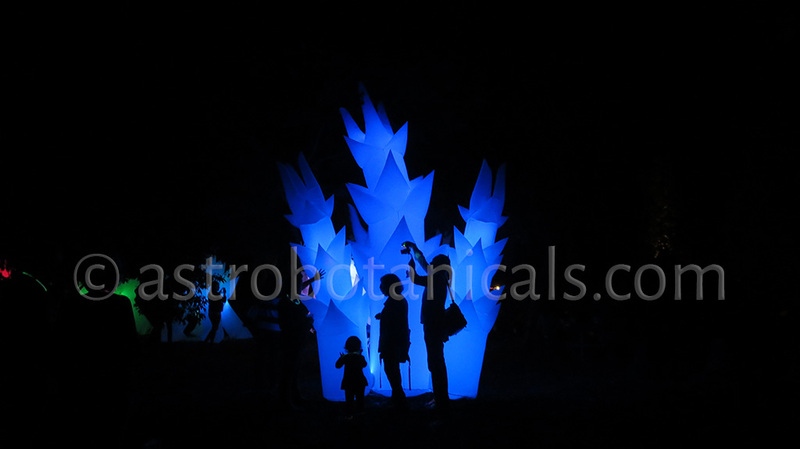 They are dragon spire stalagmites in the fairy tale forest. They are perfect for orienting large spaces and framing gateways. The central tree is fifteen feet tall with three smaller trees connected to it. 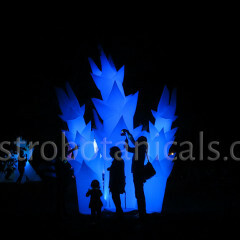 It is about eight feet wide at the base, spreading wider as it grows taller. 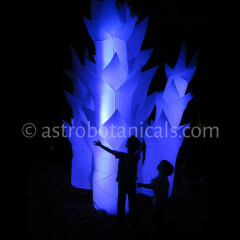 Angelic Asparagus are a connected group of four majestic, towering trees. 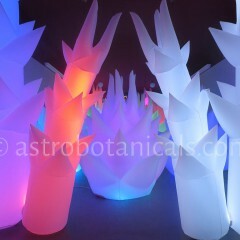 They welcome people to explore a fairy tale forest of glowing vegetable spires. They are best as frames for gateways or perimeters of a large space. 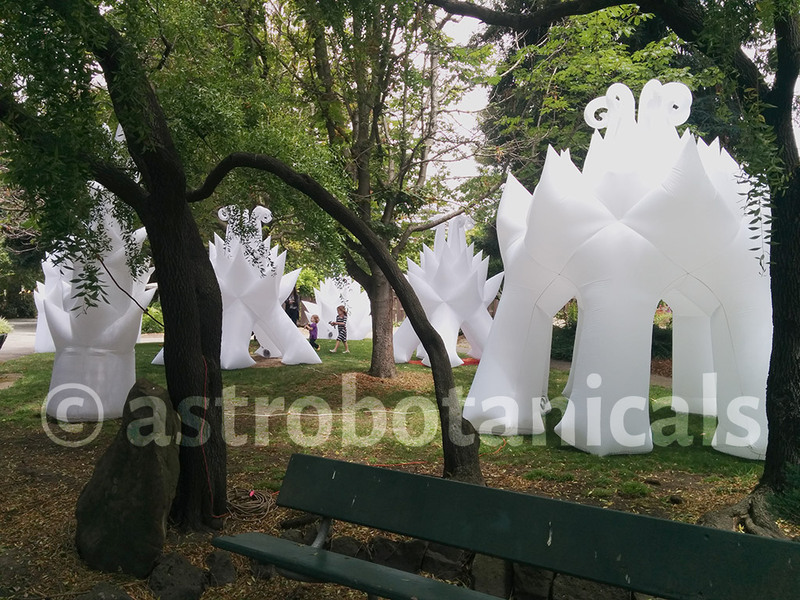 These tall, narrow sculptures will lean in a gentle breeze. 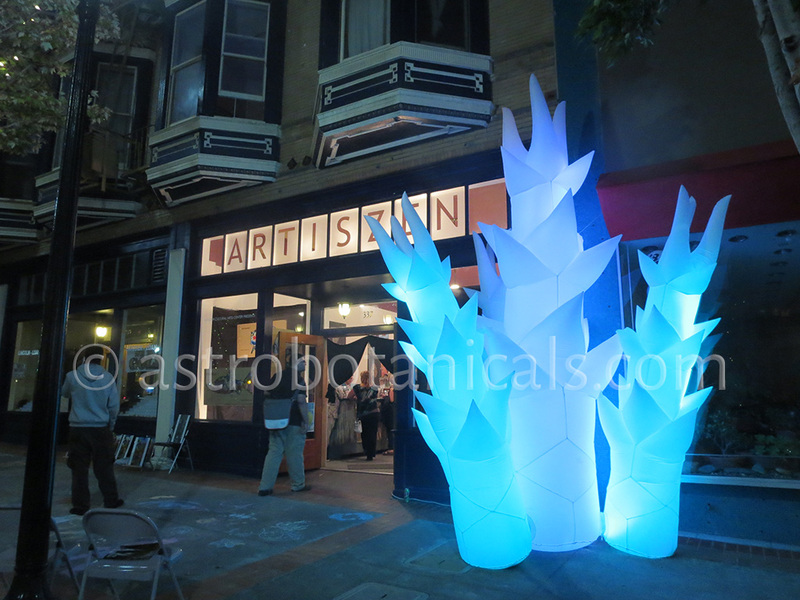 The sculpture can be tied to a wall or a pillar by tabs that are located 7 and 10 feet above the fan, for use in winds up to 15 mph. Each has three sandbags that buckle to the underside of the base. 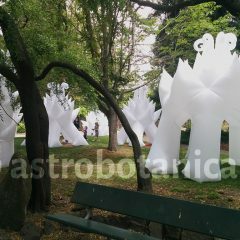 The Singular Asparagus are freestanding pillars shaped like vegetable lamp posts. 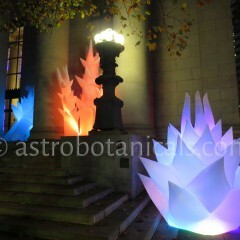 They create a single focal point or a gateway if arranged in pairs. 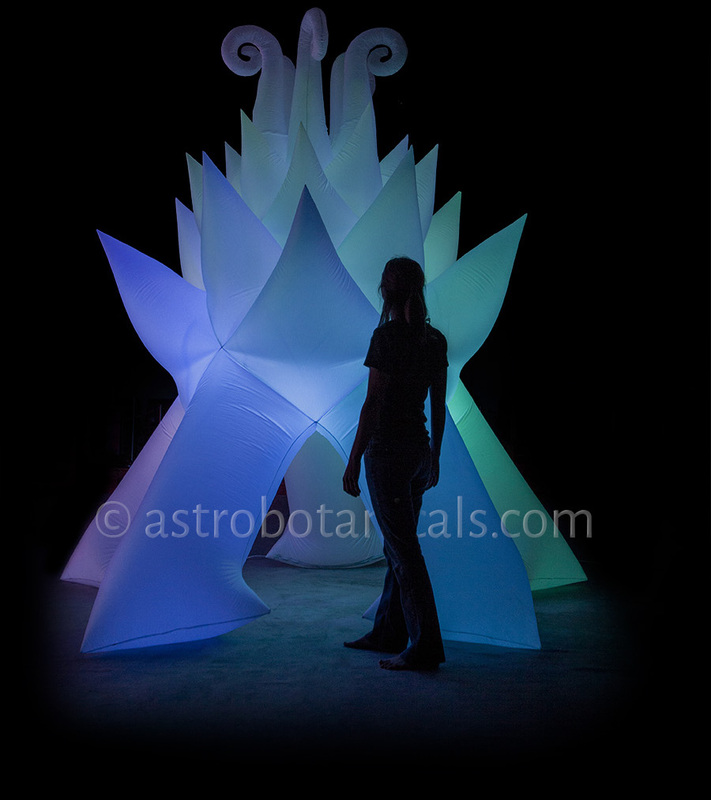 They are orientation landmarks that have a presence like an elder plant spirit or a visitor from an angelic world. 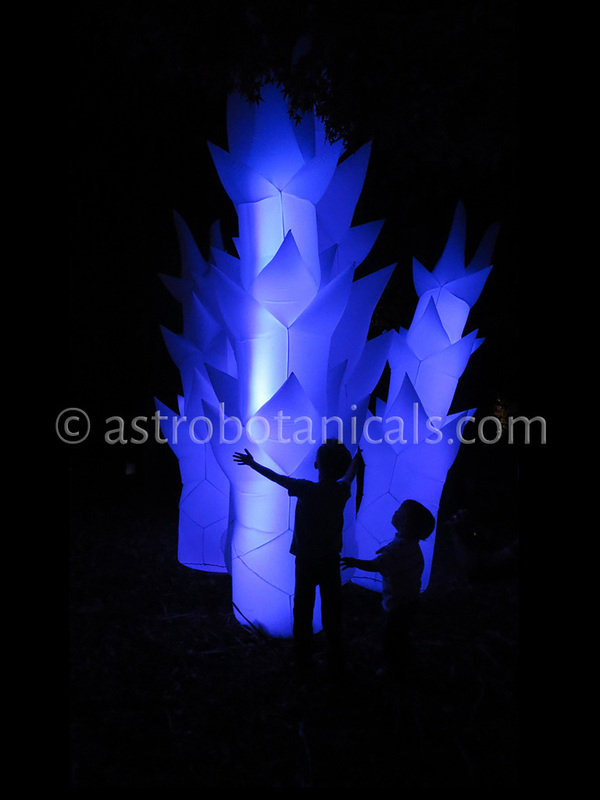 They are three feet wide and nine to eleven feet tall. 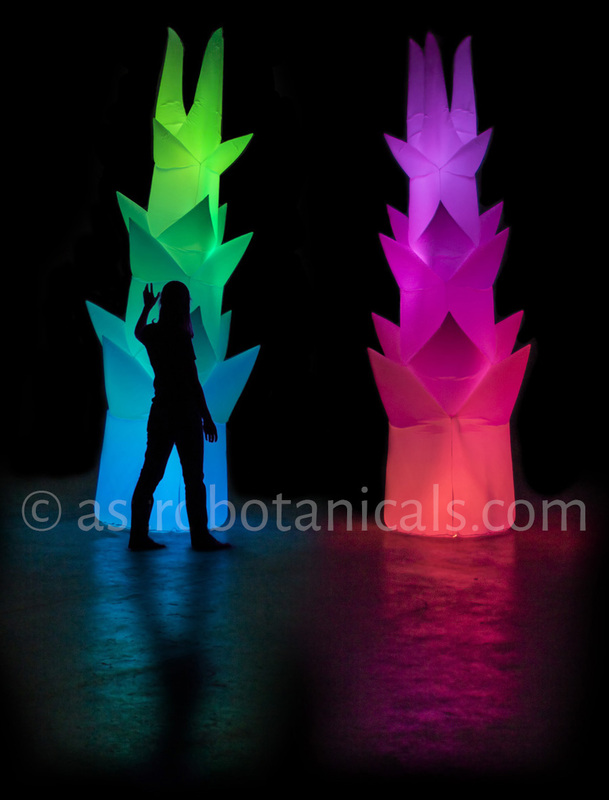 These towering trees can be centerpieces or frames for a stage or an entrance. 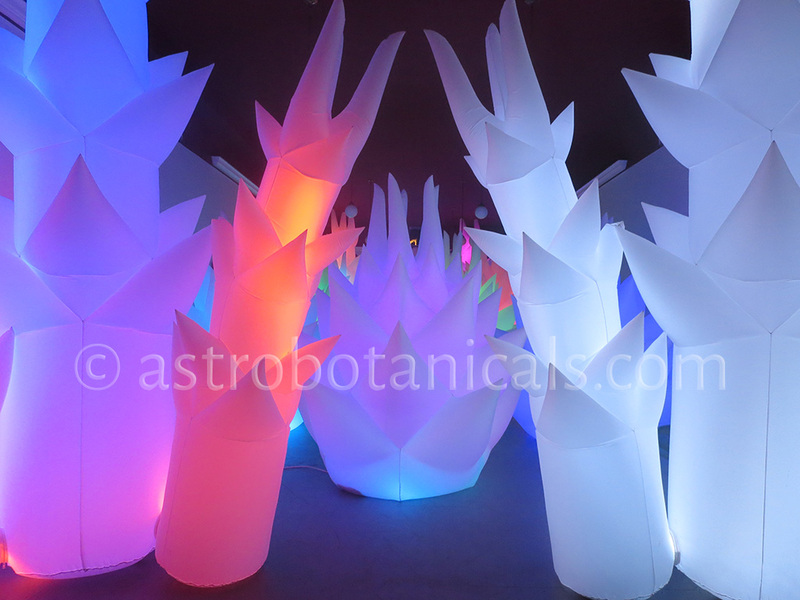 Their rainbow lights rise in a continuous motion, creating a stimulating and constantly renewing display. 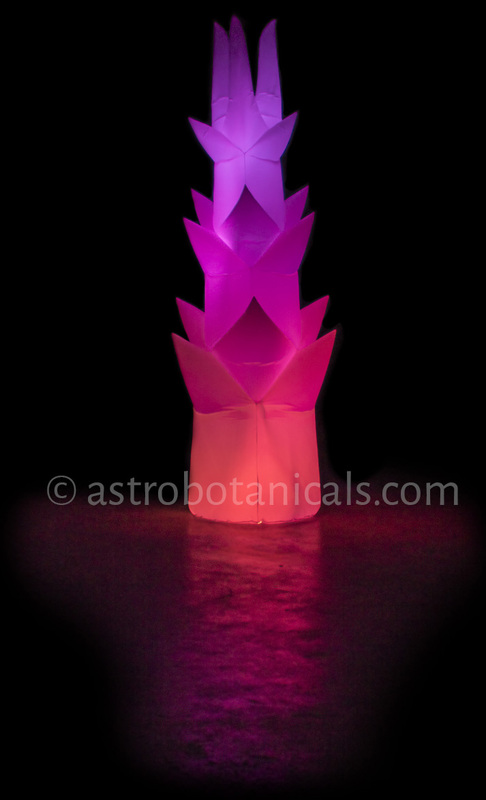 Sprouting up like majestic cathedral pillars, they express a deep relationship with the Earth. 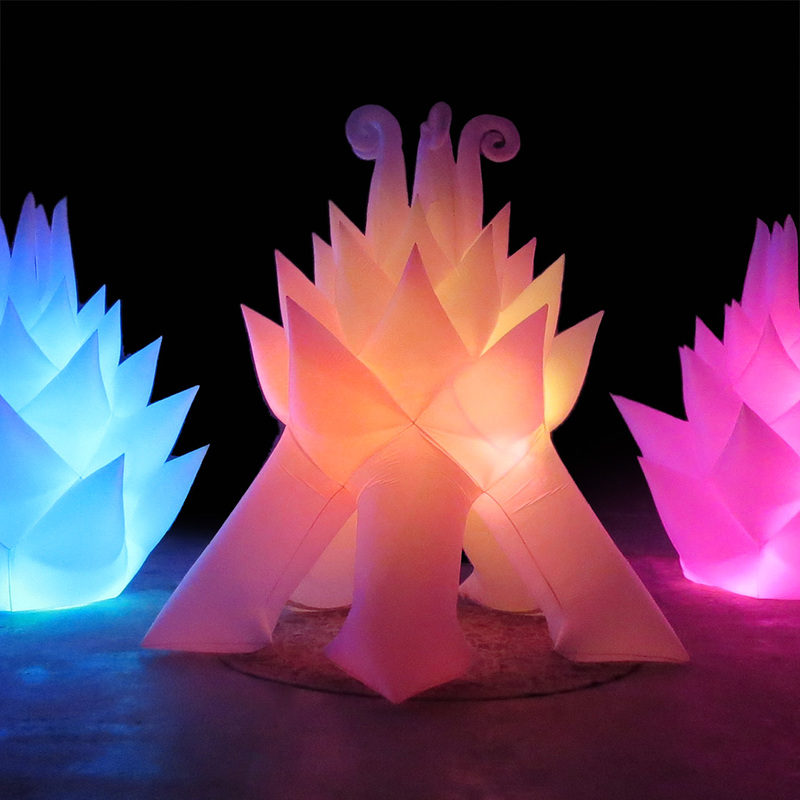 These tall, narrow sculptures will lean in a gentle breeze. 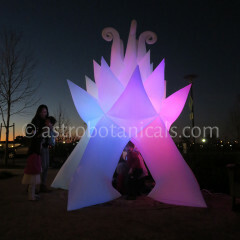 The sculpture can be tied to a wall or a pillar in winds up to 15 mph by tabs that are located 7 feet above the fan. Each has a single sand bag that buckles to the underside of the base. Singular Asparagus are available in heights of 9, 10 or 11 feet. Astro Botanicals inflatable sculptures are made of high quality materials. The fabric is fire retardant, UV resistant Ripstop nylon. The small fan is 115v, 0.26A, with a 20 foot, grounded power cord. 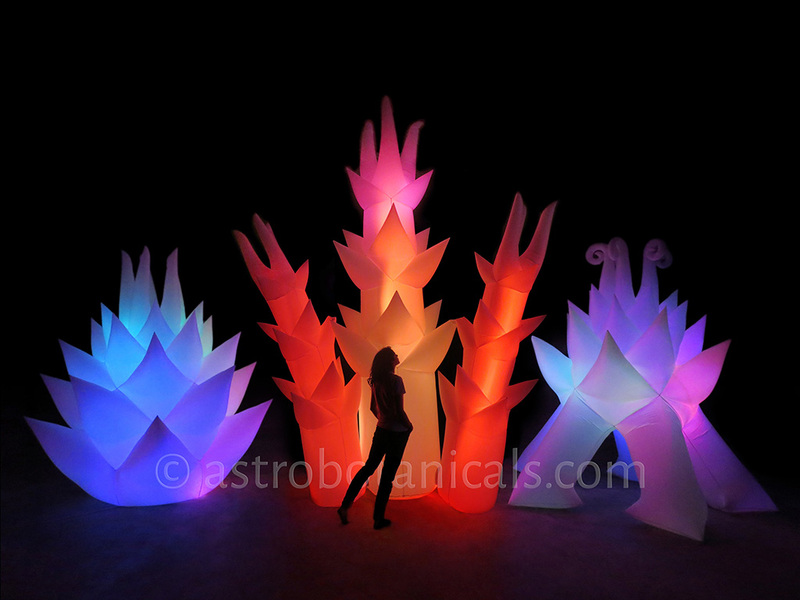 Each sculpture has durable, 0.3 Amp LED rope lights inside with multiple color settings. Each has a carrying bag and comes with one custom sandbag, sand not included. 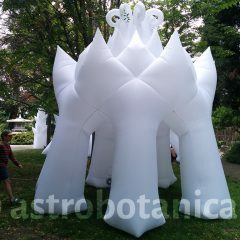 The Cactus Blossom is a seven sided black and white pillar with uplifted tentacles. 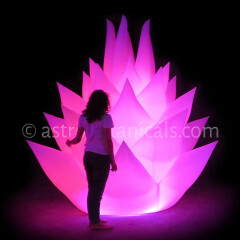 This is a large and dominant flower with a serious presence. It is visually anchored and grounded by its black network of branching circuits. 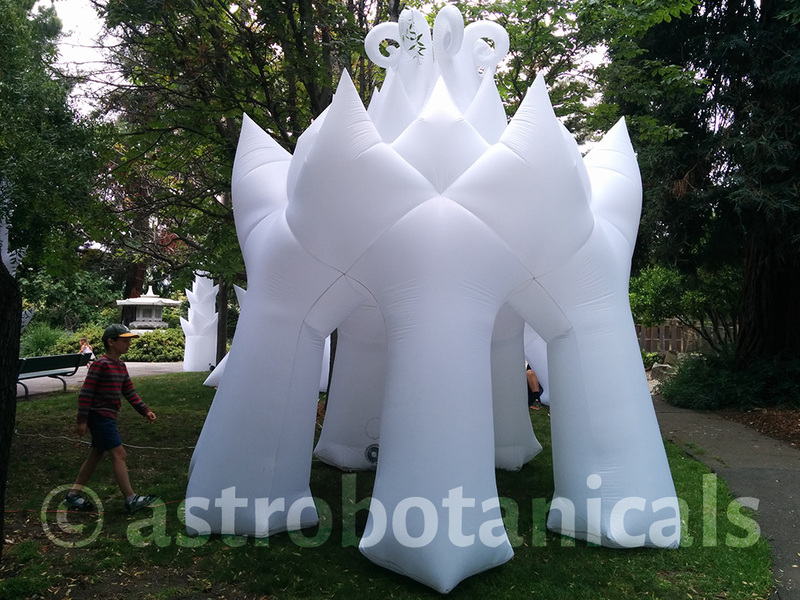 This sophisticated elder garden creature is thirteen feet tall and four feet wide. 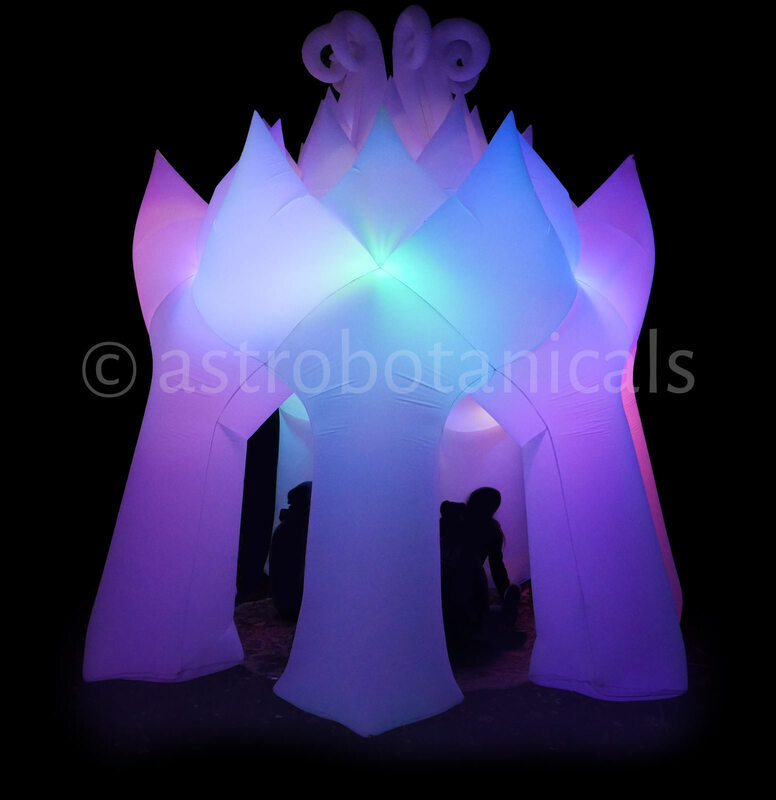 The Star Castle is a seven sided gazebo with enough room for several adults to stand up inside it. 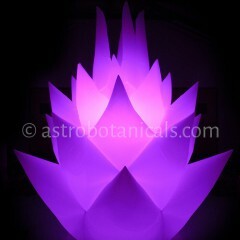 It has a seven foot high clear ceiling for gazing into the magnificent flower. 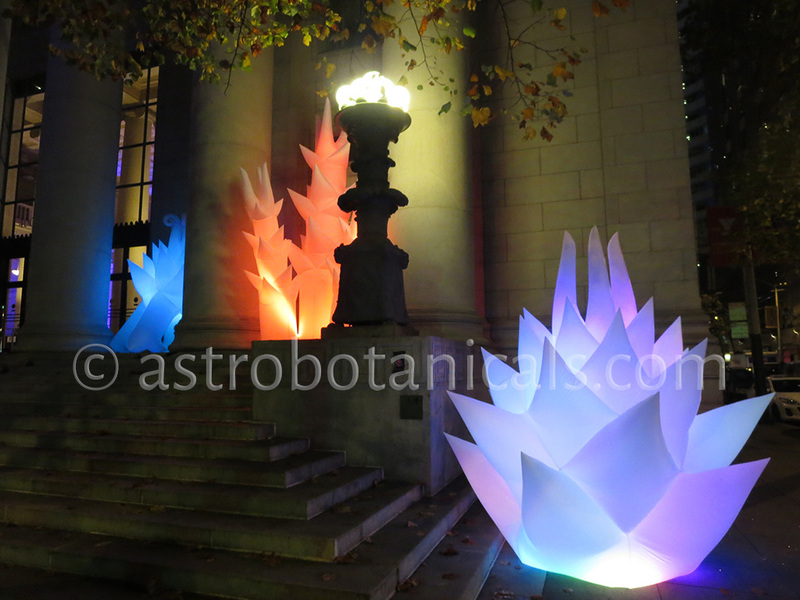 Ornamental architecture welcomes you as a flower welcomes a pollinator. It has seven legs and seven doorways and is thirteen feet tall and thirteen feet wide. 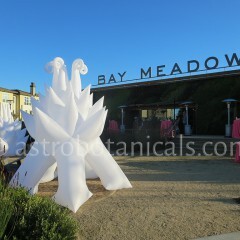 This sculpture stands on seven legs and is stable in a gentle breeze. Care must be taken that the fan does not become blocked. Sandbags go inside five of the zippered feet. 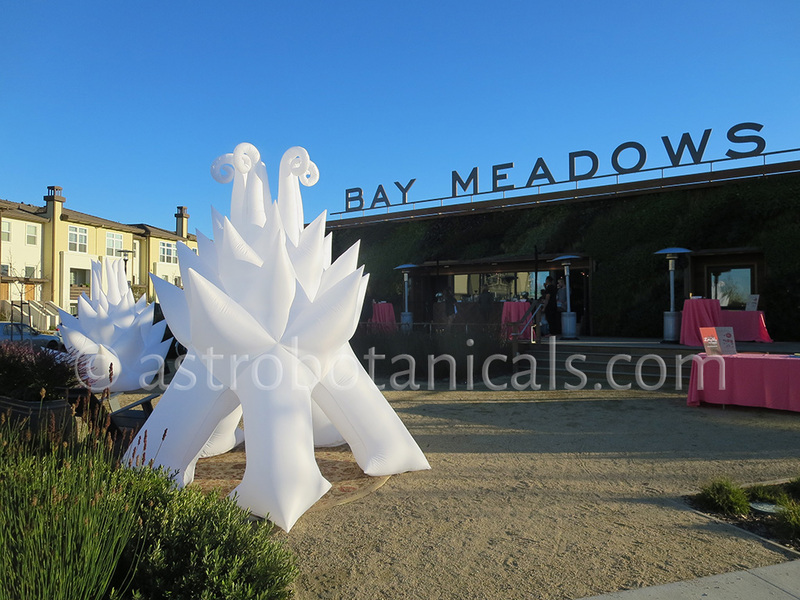 Astro Botanicals inflatable decorations are perfect for many types of events and gatherings. 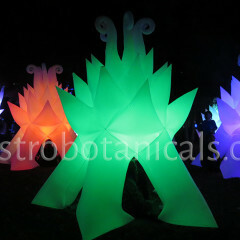 They have natural spiral flower shapes that are highly visible and promote safety. 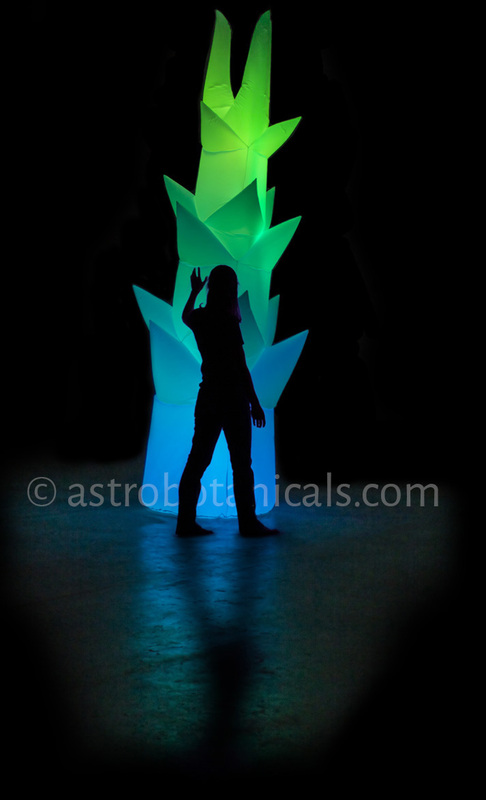 They act as beacons or lamp posts that help people find their way in large spaces. They are elegant, complex and reassuring in their symmetry. Rental fees vary depending on time, quantity and delivery options. If you are interested in renting please fill out the Rental Request form below. All rentals are subject to our Rental Policies. You will receive a proposed Rental Contract by email. 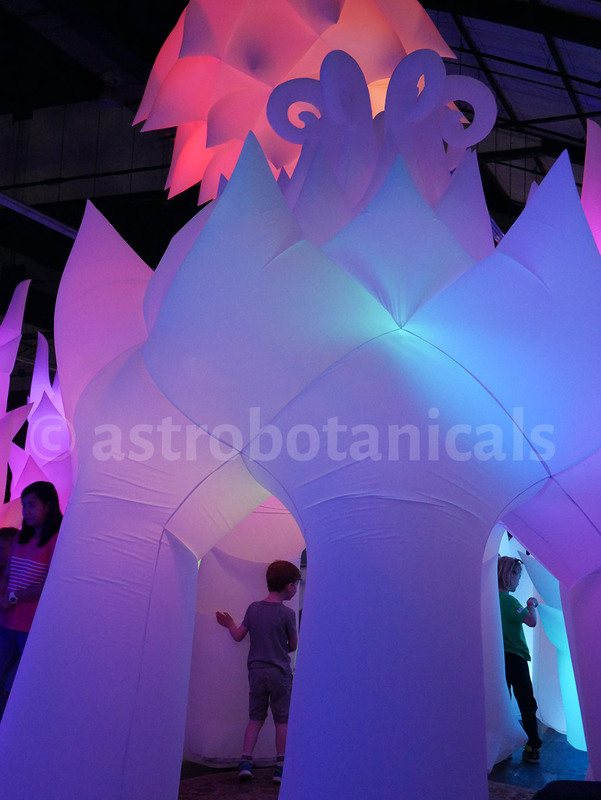 If you are interested in purchasing Astro Botanicals please fill out the Sales Inquiry form below. All sales are subject to our Sales Policies. 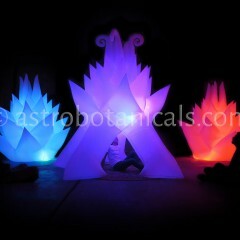 You will receive an invoice by email once details have been confirmed. 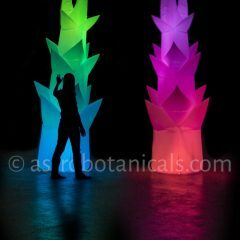 Please note for event promoters needing to purchase multiple sculptures please place your order at least eight weeks before needed delivery date.